Introduction: We introduce to you a luxurious must have necklace. 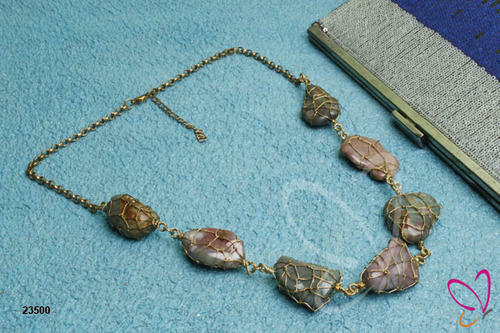 This piece is crafted out of multi-color agate stones in irregular shape and alloy metal. This piece has a combined concept of graceful design, sophisticated materials and functionality. Just rummage through this exquisite collection and pick your style with this piece. It has a lobster lock with a jump ring on one side of the piece. Dimension: It has drop length of 37 cm (14-1/2) . Total length of the necklace is 81 cm (31-7/8). Style Tip: Pair this piece with a white shirt and a pair of denim to have its maximum impact.